What if you could work with a professional who took a completely different approach to money management? Who used revolutionary web technology to help you with budgeting, protecting what’s important, and achieving financial success? What would that mean to you, your family, your business? Most people use traditional financial theories and conventional wisdom as a reason to take on increased financial risk. Instead of putting your assets at risk, we consider your complete financial picture and put your financial security first. It’s time to get it right. The Living Balance Sheet is an interactive web-based tool grounded on a unique philosophy that challenges traditional thinking and offers a new approach to financial decision making. It adheres to a proven process that helps clients achieve their financial goals. Keeping track of finances using multiple websites, statements and piles of paperwork isn’t easy. There is a better and simpler way to see exactly what you own and what you owe. With all accounts and values in one location, you always know what you have and what you’re worth. 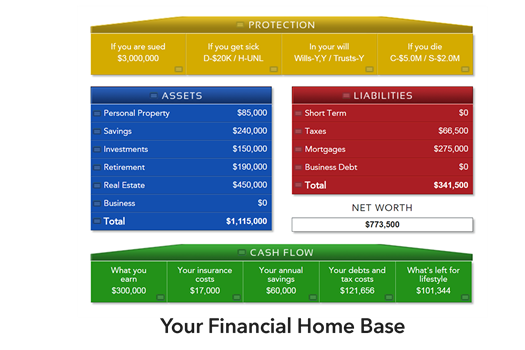 The Living Balance Sheet provides people with a complete wide-angle view of their financial world. Let us help you make the choices that are right for your future. Always consider protection first. You want to plan first for what may happen today before you plan for what may happen tomorrow. Without adequate protection, your wealth is left exposed to unexpected life events. Investing the right way means more than simply chasing a rate of return. A focus on minimizing risk and becoming more tax efficient allows you to make money while still having enough cash on hand to cover emergencies. How much do you need for retirement? Forget whatever arbitrary numbers you’ve heard. Future market performance, medical and tax expenses, and even your own longevity are impossible to anticipate. There is a better way to plan for retirement that doesn’t involve guessing about the future. The Living Balance Sheet® and The Living Balance Sheet® Logo are registered service marks of The Guardian Life Insurance Company of America (Guardian), New York, NY. © Copyright 2005-2018 Guardian. The Living Balance Sheet® system displays the financial holdings identified by the client based upon information and valuations provided directly by the client or by electronic feeds from the client’s financial institutions. Valuations provided by electronic feeds reflect the most current information provided by the financial institution as of the date and time noted, but can reflect valuations from an earlier date and time.